This cute Kitty is the victim of yet another Cat Breading. Want to create your own breaded cat? There are two options. Option 1: Get a cat, get a piece of bread (the higher quality artisan breads are nice, but not necessary-Wonder Bread will do) and get your camera ready. Cut a small hole into the slice of bread, not too big, you want it to be snug. Now catch the cat and stick the bread on the cat. This step may take awhile, but don’t give up! You will want to have your camera in your hand and snap that picture before your subject stalks away indignantly. You should be prepared to be ignored by your cat for some time after this incident occurs. But don’t worry, you made some great art! Option 2: Find a kitty on the internet. Find a slice of bread on the internet. Using your favorite art software (I used Photoshop) carefully cut out the slice of bread and kitty’s face. I used the magnetic lasso tool for simplicity. After cutting and pasting into a new layer, place the bread over the top of kitty’s face. Adjust the size as necessary to ensure a good fit. Carefully cut and paste kitty’s head over the bread on a third layer. Fuss with the placement until your kitty’s head is placed in the middle of the bread where his head used to be. 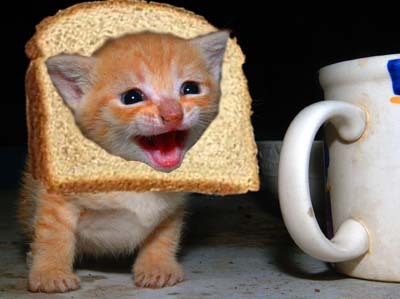 I used a blur tool around the edges of Mr. Kitty’s face in order to help him blend in with the bread. I recommend this method if you really like your cat and don’t wish to be snubbed by him (or her) for at least a week. No cats were harmed in the creation of this post. I just started a new band (don’t worry, I’m totally not the lead singer….I get to play the drums*) and we needed a new album cover. Of course, we also needed a band name, but that’s another story. No, you really don’t want to hear about this. Ok, if you insist. What we did was a random search on wikipedia and came up with the brilliant, if a little dated, name of “Horn Rimmed Glasses.” The guy who plays the cowbell liked it because it was a little bit 50s with a little bit of hipster. Perfect. Next, we needed a good title. After much deliberation and a few oreo milkshakes, we decided to go for something a little bit more cerebral. We picked a quote from Da Vinci, and the last few words were “powerless to vex your mind.” It felt a little ska, but a swing band named Horn Rimmed Glasses could rock that too, right? Then, our PR guy suggested that we actually put this whole thing together with some cover art. Well, the keyboardist’s daughter drew some really nice rainbows and puppies with her Crayolas, but that just didn’t jive with our new sound, so we went to flickr where we chose a photo at random that was listed as creative commons (because, you know, that’s not cool to steal other people’s art). After a few hours (ok, minutes) of manipulating those three items in the ol’ Photoshop, we got our album cover. So that’s the story of our band. Please don’t ask for any samples of our music, because we shouldn’t let anyone hear that. It ain’t pretty. *I don’t have any formal training with actually playing the drums, but knitting uses two sticks, so how hard can it be?